Who Put The “Poison Pill” Cap To Kill Renewables In Nuke Bailiout Bill? Will the sponsor of the renewable cap amendment please raise your hand? [Update: 2/27/18 – Unexpectedly, the bill was held, a huge short term victory. Read NJ Spotlight story. But we got confirmation that the assholes from NJ LCV signed off on the poison pill provision. These people are dangerously incompetent and corrupt too. “We are better off at looking at everything together,” said Ed Potosnak, executive director of the New Jersey League of Conservation Voters. He opposes any move to separate the nuclear and green initiatives. “Looking at everything together” provides cover for a billion dollar nuke bailout and also includes a poison pill that would kill renewable energy. Also keep in mind that Gov. Murphy’s DEP Deputy Commissioner Debbie Mans was or maybe still is on the NJ LCV Board. (We assume she has since resigned that NJ LCV post and filed an ethics review recusal request to DEP’s Ethics Officer under basic ethics requirements). Not only did NJ LCV endorse Murphy and spent over $335,000 to get him elected, but it is possible that Mans lobbied Potosnak to support the bill – or that Potosnak is just blindly supporting the Murphy administration. We need the right policies in place to move New Jersey toward an affordable, efficient clean-energy future, and this legislation fails to do that,” said Tom Gilbert, campaign director for ReThink Energy NJ. In addition to a huge and unnecessary nuclear bailout, passage of the bill would severely limit the ability of renewable energy to expand, and thereby undermine Gov. Murphy’s stated goal of 100% renewables (by the year 2050? or 2030?). Just do the math: if 40% of NJ’s electric power if generated by nuclear, how can we ever reach 100% renewable power? In addition to basic math, the economic and ratepayer costs of the nuke bailout would indirectly kill renewable energy, economically and politically. A billion dollar nuke bailout would divert capital investment away from renewables in order to maintain PSEG’s aging nuclear fleet. A billion dollar nuke bailout would deplete the finite political ability to force ratepayers to shoulder the full cost of electric power. Ratepayers will be unable to afford and balk at paying for BOTH billion dollar programs. BPU would never approve ratepayer increases to pay for both. But those two renewable energy killers are indirect and apparently not sufficient for the greedy PSEG nuclear maniacs and Senator Sweeney and Gov. Murphy. Notwithstanding the requirements of this paragraph, the board shall ensure that the cost to ratepayers of the Class I renewable energy requirement imposed pursuant to this subsection, shall be capped so that the cost to customers of satisfying the requirement shall not exceed seven percent of the Statewide average residential customer bill for energy year 2019, energy year 2020, and energy year 2021, respectively, and shall not exceed five percent of the Statewide average residential customer bill in any year thereafter. The board shall take any steps necessary to meet the cap on the cost to customers including, but not limited to, adjusting the Class I renewable portfolio standard requirement pursuant to this subsection. They would be the death knell for renewable energy in NJ and make it impossible to meet the greenhouse gas emission reduction goals of the Global Warming Response Act, which will require major investment and larger ratepayer increases to pay for them. The cap is obviously a ploy to negotiate and a bargaining chip. It amounts to a gun to the head of legislators by PSEG: approve our nuke bailout or we will kill renewables. So who drafted these cap amendments and had them inserted into the bill? Who signed off on them? No one is taking credit for them. A reliable Trenton source told me that the amendments to create a cap were reviewed and approved by Gov. Murphy’s Office and certain members of the “environmental community”, including NRDC, EDF, NJ LCV and Rethink Energy NJ. Senator Sweeney has suggested that they were part of negotiations with Gov. Murphy’s office. The authors of the cap need to be held accountable for them. 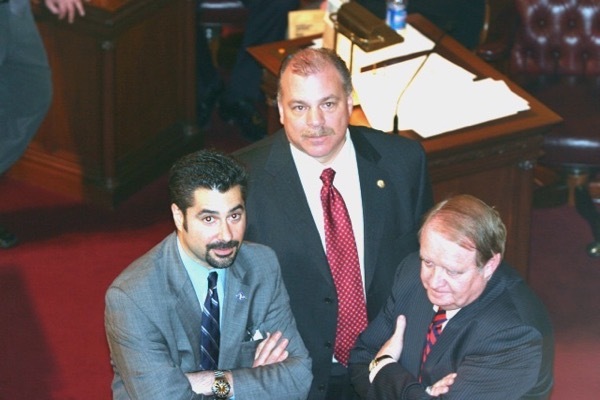 Media must force Senate President Sweeney, Gov. Murphy and the environmental groups to take a public position of the amendments that would create the cap. The nuke bailout bill must be stopped, at all costs. Taking out the cap does not make the bill acceptable. We don’t negotiate with terrorists. The ad is false and highly misleading. PennEast has not been “approved”. The elements of a cause of action for fraud are: (1) that a material representation was made; (2) the representation was false; (3) when the representation was made, the speaker knew it was false or made it recklessly without any knowledge of the truth and as a positive assertion; (4) the speaker made the representation with the intent that the other party should act upon it; (5) the party acted in reliance on the representation; and (6) the party thereby suffered injury. 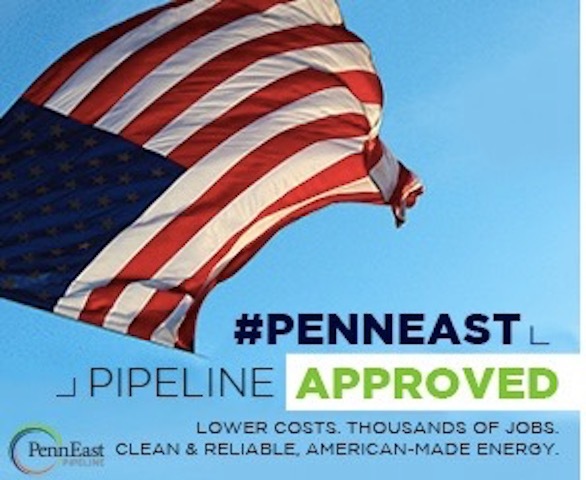 PennEast has not received the most critical approval it must secure – a regulatory approval that has been used by the States of New York and Connecticut to kill pipelines just like PennEast. That approval is the federal Clean Water Act Section 401 Water Quality Certificate (401 WQC), which must be issued by NJ DEP. That 401 WQC State regulatory review is currently ongoing at NJ DEP, which makes the PennEast false “approved” ad even more troubling. Curiously, despite numerous posts on the 401 WQC here and several emails to NJ Spotlight environmental reporters Jon Hurdle and Tom Johnson, I have been unable to convince Spotlight to cover the issue. The very little coverage Spotlight has provided related to the 401 WQC has not been accurate, and I have emailed them to explain the errors. I just emailed Spotlight editor Lee Keough to advise her that false advertising compounds their failure to cover the 401 WQC issue, which I find deeply disturbing. I will send Lee this post with a request that she take the ad down. NJ Spotlight should be covering critical issues in the public interest, based on facts and law, not accepting false advertising from private corporate entities like PennEast that it is covering. 3. the PennEast representative that wrote and paid for the false ad “knew it was false or made it recklessly without any knowledge of the truth and as a positive assertion” – that is obvious from the facts of the PennEast NJ DEP review process ad the public opposition to same. 4. proving intent by PennEast that Spotlight readers of the false ad would act on it is more complex. But clearly, if the public thinks that PennEast has been “approved” they would be far less likely to continue opposition to a “done deal” or fait accompli. 5. Some members of the public are likely to act in reliance on the false ad and abandon opposition to the pipeline. Less public opposition makes government approvals more likely. 6. The public would suffer if the opposition wanes and the pipeline is approved. [Update: Here is NJ Spotlight editor Lee Keough’s response – can she possibly be that naive? Failure by PennEast to disclose material facts while using identical terms that imply material falsehoods (i.e. using the term “approved”) is clearly a dishonest tactic intended to deceive readers. PennEast has significant interests in creating a false public impression that they have received all necessary approvals, if only to deflate and divert the opponents. Similarly, NJ Spotlight’s claim that they’ve “written multiple times” about the 401 WQC issue is flat out false. Yes, they have written about the pipeline “still needs final DRBC approval and the state” several times, but that coverage was as vague, uniformed, and unhelpful as Lee’s use of language in her reply to me above. What does “the state” mean? Who at the state? what approval? what are the NJ science, legal, and policy issues? What have other state’s done? What does the US Supreme Court say? How would that law apply to NJ Surface Water Quality Standards and all the C1 streams that would be crossed by the pipeline? NJ Spotlight’s editor can’t be precise? Lee Keogh is following the same flawed approach used by Rethink Energy NJ – ambiguous use of language to dodge the issues. Weasel words politicians love. Sweeney holds McCabe hostage – is he seeking policy concessions? Senator Sweeney on Senate floor. He knows how to pressure DEP on behalf of polluters & developers. This document is currently being updated. Please check back at a later date. Senate President Sweeney is blocking the confirmation of, among others, Gov. Murphy’s nominee for DEP Commissioner, Catherine McCabe. It is almost March, and the Senate Judiciary Committee still has not set a date for McCabe’s confirmation hearing and Sweeney has not scheduled a full Senate confirmation vote. The inability of McCabe to secure Senate confirmation has a series of negative consequences. Historically in deference to the Constitutional power of Senate oversight via the confirmation process, the Acting DEP Commissioner will not exercise bold leadership or initiate major policy changes until confirmed. First of all, as a result, McCabe has been unable to appoint her senior management team and initiate the arduous process of reversing 8 full years of Gov. Christie’s policy and regulatory rollbacks (i.e see: Forty Policy Questions For Gov. Murphy’s DEP Commissioner’s Senate Confirmation Hearing. McCabe also has been unable to appoint her own management team and purge Gov. Christie and Bob Martin’s installation of incompetent corporate hacks in senior management positions. And there was a lot of collaboration with the Martin regime’s “cultural change” program by DEP middle managers that will need to be purged as well, perhaps down to at least the Division Director level, lower in some individual cases. The DEP is a huge and complex regulatory institution, so it will take considerable leadership and persistent efforts to turn the ship of state around. Already there are signs that Christie holdovers have sandbagged Acting Commissioner McCabe. For example, the very first press release McCabe issued upon taking office was an ill advised move to double down on a terrible trifecta: Gov. Christie’s climate denying shore engineering, dredged material disposal, and luxury boat subsidy policies (see: DEP LAUNCHES PROJECT TO REPAIR BEACHES ON LONG BEACH ISLAND USING MATERIALS DREDGED TO MAKE LITTLE EGG INLET CHANNEL SAFE (not to mention the personnel issues involved). Even worse, McCabe apparently relied on Christie holdovers in the discredited DEP press office to spin the release of the DEP’s annual fish consumption advisories, transforming the historic public health focus of those advisories into a sham effort to claim reductions in toxic chemicals and improvements in “ecological conditions” (see: NJ Gov. Murphy’s DEP Commissioner – A Woman – Downplays Health Risks To Women and Children From Eating Toxic Fish. The lack of Senate confirmation also has political – as well as policy implications. 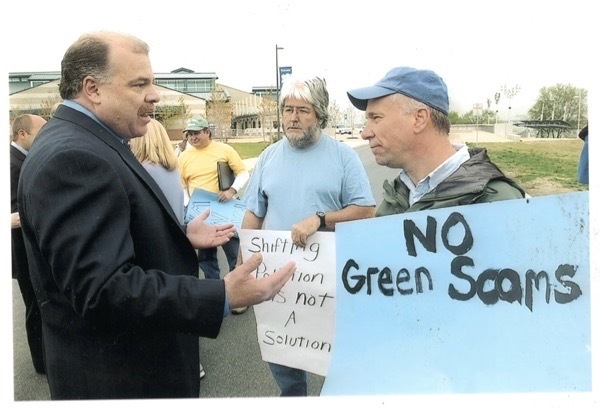 In that sense, Sweeney – who is no friend of the Gov’s Murphy’s energy or environmental policies (especially on wind) and a supporter of many of Gov. Christie’s “regulatory relief” policies – is holding the sword of confirmation over McCabe’s head and likely seeking political commitments or policy moderation from McCabe behind the scenes. He has a dirty history. Sweeney needs to be told by progressive and pro-environmental Democrats to back off and schedule McCabe’s confirmation hearing and Senate vote and get behind Gov. Murphy’s energy and environmental policies. [Update: a reader and longtime Trenton activist just sent me a note that laid out the political games being played by Gov. Murphy’s Office on the nuke bailout bill. Basically, as I suspected, the Gov. Office has frozen out the progressives and is using corporate tools NRDC, EDF, NJ LCV and Rethink Energy NJ for cover for a sellout to PSEG. Murphy is listening to National groups and dissing the local NJ state groups. Sweeney is sabotaging Gov. Murphy’s energy, environmental and even tax policies, remarkably in a partnership with NJ’s ALEC Chairman, right wing Republican Senator Oroho. Enough is enough. Get in his face! The Christie Administration’s DEP press office was notorious for spinning and, at times, flat out false statements. After 8 years, their credibility was at an all time low in all quarters. But the misleading nature of the DEP press release is not limited to the headline. The Department of Environmental Protection has eased consumption advisories on certain fish species caught in the lower Delaware River and Delaware Bay, an indication of improving ecological conditions as levels of contaminants decline, Acting Commissioner Catherine R. McCabe announced today. … “These changes reflect an ongoing trend in which contaminants from past pollution such as PCBs and pesticides continues to decline,” Acting Commissioner McCabe said. The basis for the DEP press release claims are scientifically ludicrous. The DEP did not even attempt to support those press release claims with data or science, either in thee press release or the body of the advisory document. The DEP “eased” consumption advisories based on short term and slight changes in [unpublished and likely not peer reviewed] limited fish tissue sampling data for a very limited set of chemical contaminants and fish species (some of which migrate beyond NJ waters) in a very limited geographic range. This is not statistically significant or methodologically representative data. High Risk Individuals: Includes infants, children, pregnant women, nursing mothers and women of childbearing age. Those kind of warnings should have been the headline and opening for DEP’s press release, not lies about “easing” advisories and “improving ecological conditions”. So much for Gov. Murphy’s policy priority of “putting women first”. Historically, the DEP fish consumption advisories have not been designed or intended to make science based statements about the “ecological conditions” of NJ waters or trends in state water water quality. The proper scientific forum for those issues is the DEP’s Clean Water Act’s Section 305 Water Quality Report (or DRBC toxics criteria or TMDL documents). Commissioner McCabe is a lawyer and experienced regulator, and must know this. McCabe is actually spinning and misleading the public worse than her predecessor, Bob Martin, a man with no legal, scientific, or environmental training or experience. We’re deeply disappointed that a female DEP Commissioner would downplay health risks to women and children, while spinning the science to mislead the public. But why on earth is Jeff Tittel essentially pulling his punches and supporting DEP’s spin? If the Christie/Martin DEP press office pulled this kind of stunt he would have blasted it as spin. That post was ignored by activists and NJ media. Since then, Eric Stiles of NJ Audubon – who spent the last 8 years seeking private foundation, billionaire, Christie DEP and corporate funding for logging schemes in the Highlands under the false scientific justification of creating “young forest habitat” – has dodged all that accountability and is now apparently the sole media “green” spokesperson at NJ Spotlight for forests and climate change risks. It is well known that the Christie Administration is irresponsibly outright hostile to any plans or programs to address climate change, and instead has actively promoted new fossil fueled gas plants and pipelines across the state, while suing to block the Obama EPA Clean Power Plan climate initiative. But here’s an aspect of that climate negligence that has gotten no attention: reducing the ability of NJ’s forests to store carbon. The controversial proposed DEP logging plan for Sparta Mountain is not NJ Audubon’s or DEP’s first logging operation. Highlands forests are under assault from the State agency directed by the Highlands Act to preserve them. Getting virtually no attention are the facts that NJ Audubon also logs Newark watershed lands (see page 43) and DEP has proposed logging not only at Sparta Mountain but in Weldon Brook WMA and Mahlon Dickerson Reservation. Some think that Hamburg Mountain is next in line for logging. Accountability, where the hell is it? Stiles is now a media source and a hero – why is that? [Update – 2/19/18 – Apologies to readers for a serious omission. The reality is actually worse than my original post above would suggest. Now that RGGI will be restored, NJA and ALS will receive those funds – which amount to about $4.5 million per year. Keep in mind that these same to two groups did nothing to make RGGI better, but cynically and opportunistically merely used it as a funding vehicle for their own organizations. Since then, both groups have done virtually nothing on climate change – Audubon’s logging actually made things worse – while both groups received funding and worked cooperatively with the Christie Administration to provide political cover to DEP rollbacks. I found it outrageous and totally unacceptable that they now will milk even more public funds from a Democratic administration.